Hoping to further help Aussies plan their trips around road congestions, TomTom has integrated its Live Traffic site with Yahoo!7's news website. 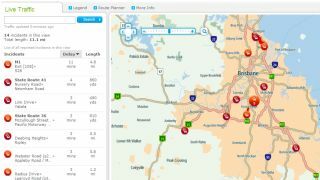 Updating every two minutes, TomTom's site has real travel time data captured by vehicles across Australia's entire road network, combining traffic incidents and "real-time flow of traffic from multiple sources". Even though TomTom's Live Traffic site will have the same information available anyway, integrating the website-based feed will be another boost for Yahoo!7. "TomTom's live traffic maps integration represents a highly engaging way we can deliver utility to our users and connect them to the news and information that matter to them most," said Sue Carter, director of Connected Life and Information at Yahoo!7. Yahoo!7 has geo-tagged Live Traffic pages for New South Wales, Victoria, Queensland and South Australia.